in the database "items" and I want a Silva page where only those rows are shown where the color is 'red' or 'yellow'. To achieve this I created a Silva Code Source  with the parameter "color" which is of type MultiCheckBoxField. The field of this MultiCheckBoxField includes the above values. As the database evolves over time the ENUM and SET fields gets expanded, e.g. more colors are added. Being lazy and forgetful I did not want to update the items of the parameters in the Silva Code Source by hand; the items list should be populated automatically by looking up the mysql database. And here's how to do it. Instead of using the Silva API we need just some zsql methods and python scripts to get it directly from the mysql back end. ## Z SQL Method "sql_getDescription"
This zsql method returns more or less the same as the mysql console does. The output of the zsql-method cannot yet used for populating list items in forms because the format is not correct yet. Therefore, we need a python script that modifies the output so that the form can directly read it . Whenever the external source in a silva document, in this case a Silva Code Source, is reloaded a query is sent to the mysql database and the shown check boxes are being updated. Very Nice! ## Z SQL Method "sql_getSelection"
Please note that we are using "dtml-var" and not "dtml-sqlvar". "dtml-var" takes the input as it is given without modifications (beware of sql injections!) whereas "dtml-sqlvar" does escaping and adds additional protection by restricting the input data type. The figure below summarizes how everything is interconnected. The above How-to can probably be used with other parameter types as well; I've used it so far with MultiCheckBoxField and ListField. 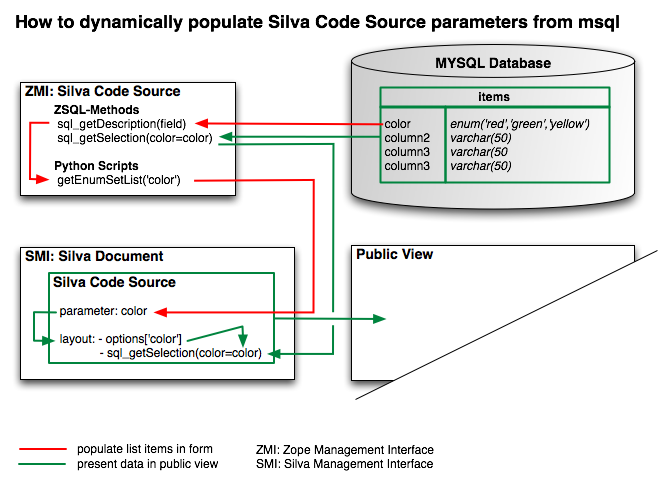 Attention: Don't use Silva SQL Source if you want to use the mysql LIMIT clause, use Silva Code Source instead. Silva SQL Source uses the standard LIMIT=1000 which cannot be overridden (Status: 15.10.2007). Please note that the lines 2-4 could probably be written in one single line using some regular expressions. But as far as I remember regular expression are not directly available in python scripts within zope.